There’s been a few articles in the popular press recently announcing the discovery of dark matter particles coming from the Sun. This is not the case. No science team is claiming they’ve discovered dark matter. The story traces it origin to a paper being published in MNRAS, which could be an indirect detection of dark matter, but could also be a few other things. It is an interesting paper, nonetheless. What the paper actually looks at is possible evidence of axions coming from the Sun. Axions are hypothetical particles that were first proposed in 1977 to address certain issues in quantum chromodynamics (QCD), which describes the behavior of quarks and such that make up protons and electrons (among other things). There has been no evidence for axions, but if they exist, then the Sun should produce axions through nuclear interactions similar to the way it produces neutrinos. According to the model, axions would be be low mass, chargeless particles that don’t interact strongly with light. This would make them a suitable candidate for cold dark matter. Of course this would also make them particularly difficult to observe directly. But unlike other dark matter candidates, axions do interact slightly with light and electromagnetic fields. So we might be able to see them by their interaction with Earth’s magnetic field. 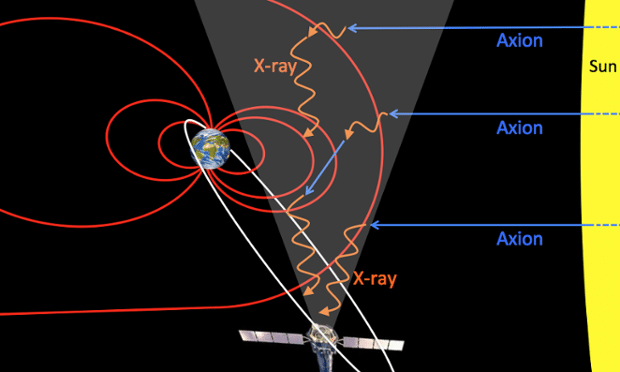 In the paper the authors demonstrate that high energy axions striking the Earth’s magnetic field could produce x-rays. When they modeled this idea they found that axion-induced x-rays would have a seasonal variation due to the varying tilt of Earth’s axis (and thus its magnetic field). They then looked at x-ray data from the XMM-Newton spacecraft, and found that it had in fact detected a seasonal variation of x-rays. This variation is consistent with the axion model. Of course before we can say that it’s definitely axions, we need to look for other possible explanations. Not surprisingly there are several. For example, the seasonal variations could be due to subtle and complex interactions between the solar wind and Earth’s magnetic field. So axions are a good candidate for this cyclic variation, but not the only candidate. Where things could get interesting is through a more detailed study of the seasonal x-ray variations. If they are produced by axions, then the x-rays should have distinct signatures in their spectrum that would distinguish them from other models. So like many cutting edge discoveries it has potential without clear confirmation. You published a blog post two months or so ago about some scientific publication where they looked at distant galaxies and analyzed their XRAY spectra. You said that they discovered a very faint line in the XRAY spectra which is unknown to any atom or molecule. Did this XRAY observation had the same spectral line?